Town attacker Harry Cornick is unlikely to feature for the Hatters in tomorrow’s home clash against fellow League One promotion chasers Peterborough United. Meanwhile, there are no doubts over midfielder Alan McCormack after he was on the bench for Tuesday night’s FA Cup third round replay defeat to Sheffield Wednesday having started the previous four games, not missing a single minute. 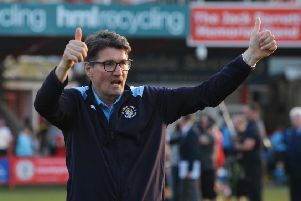 Harford said: “We took Alan off his feet and gave him a rest on Tuesday. On the rest of the squad’s availability, Harford added: “They’re off their feet today, they’ve been up to the swimming pool and they’re just resting, recovery basically.